On first time open of the ENgage! 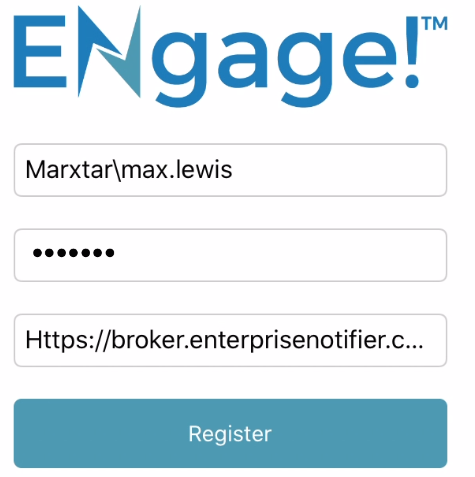 application post installation, you will be presented with a screen similar to that below, which will enable you to register (Link) your device to the Enterprise Notifier solution. If you have been given the privilege to use ENgage! by the Enterprise Notifier System Administrator, you will be allowed to register your mobile device. Your username and password credentials will be those that you use to sign into your usual company network, usually from your desktop PC. Note that the username requires both your company domain name and your username as entered in the format domain\user. Note that the password line text is masked. The server address will usually be provided to you by your Enterprise Notifier System Administrator and typically via email. If you don't receive it but would like to join the ENgage! programme then please contact them and ask for the "Enterprise Notifier Broker Service URL". Note that the example below is using HTTPS (SSL) communication which is more secure than the more common HTTP connection; The server address (URL) that the administrator supplies should define which of these protocols will be used. Enter your credentials as required and press the (green) Register button. Note that it might take a few seconds to complete the registration. If you successfully authenticated it will enter the main ENgage! application workspace. 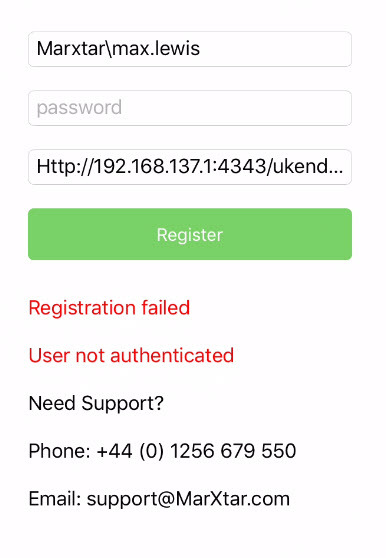 If you do not authenticate correctly the screen will show "Registration Failed" as shown below. We intentionally do not show too much detail during registration given our APP is openly available on the Apple or Android stores and we do not want to give away too much to an unauthorised user of the system. If you have any issues with connection then please contact your company Help Desk or Enterprise Notifier System Administrator for further assistance using the provided contact information. You have uninstalled and reinstalled the ENgage! APP.